Scotland’s landmark decision to reject independence is not the end of British uncertainty. The 55:45 split, with almost all the votes counted early on Sept. 19, leaves the UK intact. But the terms of the unionist victory introduce tensions which could yet lead to a national division. UK investors and companies will be relieved by the result. Almost a tenth of the UK’s population and its GDP will now stay put. The feared economic, financial and monetary disruptions of a split will not materialise. Scottish banks, including Royal Bank of Scotland, will probably stay in Edinburgh. They will continue to enjoy the support of the Bank of England, which will set its monetary policy with Scotland in mind. The UK has also dodged a bullet politically. The continued presence of euro-friendly and Labour-voting Scots makes it less likely that Britain will leave the European Union, so-called Brexit. The odds of a defeat of the more euro-sceptic Conservative party in the 2015 election increase. Even if the party stays in power and holds its promised referendum, the with-Scotland UK is more likely to vote to stay in. And UK officials can devote more time to negotiating a better deal in Europe, rather than a Scottish divorce. Yet the vote will still change the UK. When it came down to it, 45 percent of Scots decided they’d rather Scotland was fully independent. The panicked attempts to implore them to vote No to the idea forced the leaders of Westminster parties into a series of concessions that look both unprecedented and contradictory. Despite being responsible for over half of its own spending, Scotland’s parliament still only has around 10 percent of associated tax-raising powers. Pledges by UK political leaders appear to entail that a far greater degree of decisions will be devolved. If Westminster’s pledges on devolution are meaningful, Scots could gain control of over half their share of tax-raising. The road to this so-called “devo-plus” could be bumpy. Despite apparently agreeing on a timetable for handing over more power, the political leaders of the three main UK parties have yet to nail down what those powers actually are. Compounding the confusion, the leaders implied on Sept. 16 that after independence they would maintain the so-called Barnett formula, the calculation which means the Scottish government currently gets a higher than average share of the UK government’s budget. Logically, that grant should contract as more tax-raising powers are devolved. It is possible that when the dust settles, the British political leaders will treat their campaign promises as mere intentions, not firm commitments. The debate over new devolved powers could weaken Prime Minister David Cameron. If he were replaced by a eurosceptic leader, Brexit fears would reignite. The clear rejection of independence is unlikely to weaken Edinburgh’s hand in demanding substantially more powers. Any back-tracking by Westminster would enrage Scots who voted for the Union under what they would consider false pretences. But devo-plus carries its own risks. Too favourable a deal for Scotland, either perceived or real, will increase resentment in Wales and Northern Ireland, as well as the poorer parts of England. If devolution spreads, the UK could start to look more like a federal state. The result could be a decentralized, accountable and progressive Union – or a much more constitutionally confused and inefficient one. The pound may have relief-rallied to 1.645 against the dollar. But if investors sense political instability is still possible, any calm will remain temporary. 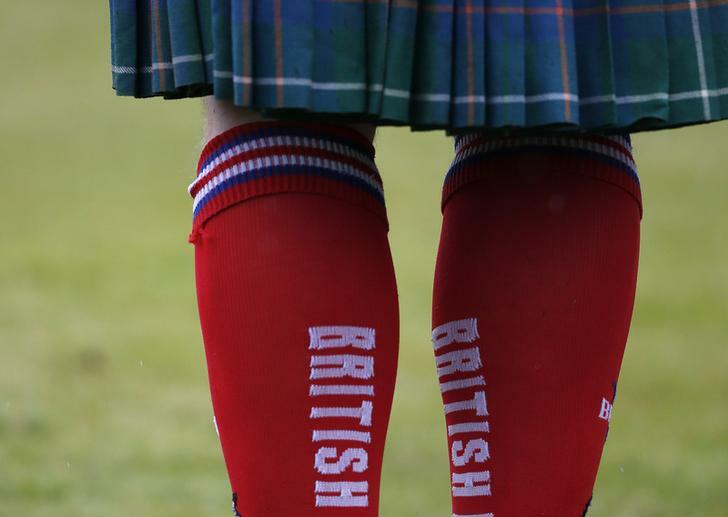 A heavyweight competitor is seen at the annual Braemar Highland Gathering in Braemar, Scotland September 6, 2014. Scotland voted to stay in the United Kingdom in a referendum on Sept. 18. With all but the last votes counted in the early hours of Sept. 19, 55 percent of Scots voted to stay in the Union, with 45 percent against.